How to design Workload Model for Load Testing? In this blog post, we will see how to design workload model for Load testing. If you not aware about what load and stress testing is and the differences between load and stress testing, please visit my previous blog post Types of Performance Testing and Differences between Load Testing and Stress Testing. Designing workload model is a critical and mandatory activity, before you perform load/stress testing. Distribution of load across the identified transactions in a given time is called Workload. Workload helps us to study the behavior of the system under various identified workload model. Workload model can be designed by predictability, repeatability and scalability. E.g. consider a website which provides online seasonal greeting cards. During festival seasons, the number of visitors will be high, whereas during non-seasonal time, visitors will be minimal. By predicting the number of visitors, one can design workload model accordingly. While designing workload model for banks or financial sector application, once should consider repeatability as well as scalability too. Before designing workload model, it is important to collect relevant data which helps us to create effective workload model. Following items are required, in order to design effective workload model. Consider a web application which publishes your post across social medias; total number of concurrent during peak business hours (from 11:00 to 13:00) per day is 1500. Following are the list of transactions performed by the users. Our objective is to design workload model to perform load testing. From the available data, I have arrived workload model as shown below. Above table has a scenario Submit Post with 3 iterations along with 15 minutes of ramp up period, hence the transaction to be achieved will be 4500. There is 100% load distribution across all the actions. Now next step is to prepare the graph for load testing. 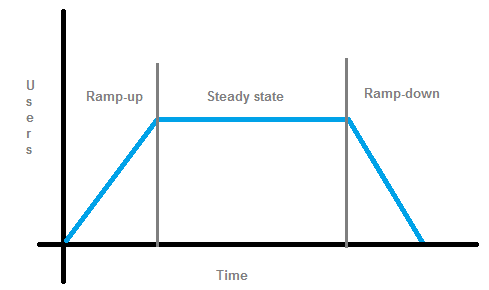 Usually load testing will be done at least for an hour with 15 minutes of ramp-up and ramp-down period, and the steady state period will be for 1 hour. Below is the pictorial representation of workload model. Let me summarize the steps to design workload model. Identify the metrics such as transactions, concurrent users etc. Important note: it is not advisable to have steady state during the initial phase; because sudden load to the server may clog the server resources and leads to internal failure. Continuing the load test with such failures gives invalid data for analysis. In next blog post, we will see about designing workload model for stress testing. Please let me know if you have any questions in comments section. Thanks! Thanks for explaining an interesting topic of performance testing in a very simple yet beautiful fashion. I was looking for some stuffs on ‘how to design workload model’ but got very disappointed from the available stuffs on internet. At last your blog page gave some good insight. 2. Transactions in second e.g. Login 5 etc. Now how did you get these info? Who would give us this TPS/ no of iterations or it is our responsibility to calculate these? Waiting for your reply on this. Have a nice time ahead! Thanks Pratim! Please refer slide #8 in this presentation. I have listed how to start performance testing project. Please check this. Please provide your E mail ID. Please ping me in http://www.fb.com/QAInsights. I will reply you immediately. Thanks! I have one script that contain a,b,c,d,x,y,z these are actions. I give 10 iterations.even no vusers should run only even no no actions,odd no virtual users should run only odd no iterations. What is the need of doing 3 iterations.why can’t 1500 users doing 1500 transaction in a single iteration is enough to get the required performace parameters of the website? 1. Do all the 4500 transaction needs to be completed during the load test of 1hr? 2. If 4500 transaction is not completed during 1hr then what can be the possible reasons for that? 3. Why performance test in conducted with more than one iterations? What would be the answer of below question? The ramp time configured for a test is 120 sec for 60 users. The loop count is 5. What is the delay between the threads?